Paying off balances is a great step in every situation. If you're refinancing or buying a home, having lower minimum payments will improve your debt-to-income ratios and afford you breathing room with your monthly payments. The Debt Snowball Calculator & Avalanche Debt Calculator applies two simple principles to paying off your balances. Pay off your lowest balances first (if there are two with the same balance, pay off higher interest rate first). When a balance is paid in full, apply its monthly payment to the next lowest balance. The debt snowball calculator offers success in completion. Lowest balances are paid and motivation is created to continue. The avalanche debt calculator offers maximum interest savings. Paying off higher interest cards provides more savings to pay down balances faster. Use this debt snowball calculator and avalanche debt calculator to see how this can be applied to your balances. Discover what would be the best approach for you. The calculator automatically functions as a debt snowball calculator. 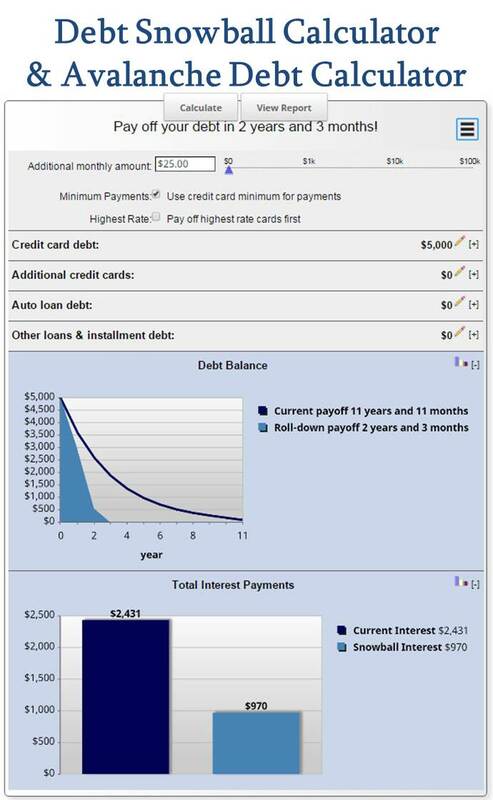 To use the avalanche debt calculator, select "highest rate", then the calculator will apply any additional monthly amount to the balance with the highest rate. When that balance is paid in full, the balance with the next highest rate will be paid down. This continues until you have avalanche-d through all of your balances and they are paid in full. Avalanche Debt and Debt Snowball Calculator contains a full payoff and amortization schedule in the report. Click the "View Report" button for a detailed look at the results. Save and/or email the results of the Avalanche Debt and Debt Snowball Calculator by clicking on the three-line icon in the upper right hand corner of the calculator.